Went to Panther Creek this weekend to celebrate my mom's birthday and hang out with the fam....so much fun. Emily had pigtails for only the second time....so cute!! Emily LOVED riding over to the gym in her wagon. Mommy and Papa gave it to her for her 1st birthday. She also LOVED the "buhvs" .... balloons are still favorites! These stairs were a favorite item....she thinks that she can climb them......not quite by herself yet! You can see here that her current speed is RUN! Emily now has 6 teeth and is eating pretty much anything and everything.....though sometimes she has to be reminded that she likes something. We celebrated Mom's birthday ..... she got some fun stuff, including two saucers to replace broken ones from the everyday dishes she's had since their wedding!! Tonight I had my friends Sarah and Kelly over for the second annual first day of school celebration dinner. No, I'm not a school teacher, but they have both been teaching (7th grade math and elementary music, respectively) for around 10 years each! Last year we gathered at Sarah's and this year I volunteered to host. Of course, what I really needed was Kelly's husband, Adrian, to help me hang my trellis! But, whatever the reason, they all came over and we had a great evening. On the menu tonight was a stir fry mix I had in the freezer, purple juice salad (served in my new thrift-store parfait glasses - found three more this past weekend at the Goodwill store for $0.79 each! ), brownies and leftover home-made ice cream. Since they are family to me, it was a very low-key dinner -- which included me making the brownies as they were walking in the door -- very unlike me. I usually plan way ahead! And the finished product, on the wall.....it will be so fun to see what different things I can do! I painted the solid portion on the left with chalkboard paint, so that should be very fun to play with. And, of course, no project in my house is ever complete without a new tool or some addition to my hardware closet. You've already seen my new sawhorses, plus I picked up some more screws and anchors. Gotta have the correct parts to do the job right! I enjoyed a lovely hour or so swinging in the hammock, watching the birds, and reading.....oh how fun this is going to be. and the after! I tried it out after mowing, but had dirty feet and didn't read the instructions on how to get in the thing, so I didn't spend much time and it wasn't very comfortable because I didn't know what I was doing!! I'll have to go back out later this afternoon and give it another whirl. Who ever said the weekend was supposed to be restful? So, last night I decided to go ahead and start painting that trellis from last weekend....it was as close to cool enough as it gets in August in Texas, so I set up shop in my garage. See those nifty things under my trellis? Folding, plastic sawhorses! So great. I've been *needing* sawhorses for a while - they just make solo projects so much easier. But, I didn't want to buy big heavy bulky ones. And I think my grandpa made my dad's eons ago - I sure didn't want to do that (or even know how!). So, when I saw these, I knew it would be exactly what I needed. Another recent find is these Tornado hooks that screw straight into drywall without having to use anchors or find studs. Perfect for my garage. I got a hook for my push broom several weeks ago and it is perfect. So, when I bought my sawhorses, I went looking for hooks to hang them on the wall....voila! Perfect size. Measured the span that would be right (used painters tape to get them reasonably level) and hung them while I was waiting for paint to dry. See how perfect they are hanging up?? This is why I have a garage. Plus, of course, to house my car. The other project of last night was to illuminate my gazebo. I've flirted with the idea of hanging lights for a while. Even bought a ton of cuphooks last Christmas intending to hang lights out there (because that is how lights are hung on my parents' house). I abandonded that idea as too labor intensive. Finally, after seeing some cute dragonfly lights on my friend Cindy's patio hung with staples, I decided to just bite the bullet. So, I bought some basic round lights and stapled them up around the perimeter. Yes, I ended up with slightly more length than I needed, but I just pulled out the bulbs from the doubled over section and have them as spares (which is good because I did break one while hanging them!). Ever try to hang lights by yourself? Thank goodness for a long extension cord and electric staple gun! I also decided to hang one row of cuphooks on the front and use that for seasonal fun lights....these little chinese lanterns jumped out at me and I couldn't resist. I'll probably see what fun lights I can find at Christmas time - and might even see if I can change out every other bulb in the regular string to be red or something.....we'll see. And on to the fun of today. I unintentionally woke up early and just decided to get up. So, I was out the door about 8:30 to run some errands and find what I could find. Lowe's was the first order of business. I've been wanting a hammock to hang between the two posts in my yard for a while....found one (on sale 50% off!) and got it home, but it was too big. Boo. So that goes back to the store. Then down to Target to get another string of lantern lights - one wasn't enough. En route to the estate sale that was the ultimate goal, I found a thrift store and scored several treasures. A set of white shelves that are very sturdy - the openings are about 15x15x6 and it is about 30" high. 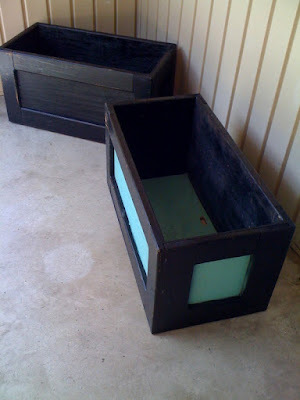 Could be great scrapbook paper storage, except that I have mine stored in other ways. Basically, I don't know how I'm gonna use it yet, but for $4.94, I couldn't pass it up. I also got a pair of ice cream sundae dishes for $1.91. The estate sale was a bust, but as I was driving aimlessly pointed in the direction of home, I stumbled across many more garage sales. I don't usually stop just because of the hassle of in and out of the car and I'm usually on more of a mission. But today, that was my mission. I found a couple other treasures - a fun snowman to add to my collection for $2 and a ribbon plate for $1. Plus I bought a book for 50 cents. Once home, I unpacked all my treasures, hung the second set of lights, tried to hang the hammock (which required a trip back out and all around town because I didn't have the right hardware), repackaged the hammock to return, painted part of the trellis and salvaged boxes with chalkboard paint, painted a spot on the bathroom ceiling that was damaged when I had a A/C vent installed earlier this summer, and unloaded the dishwasher. Now, I am gonna go season my steak for dinner, then chill for a while.....probably pay some bills and maybe run a load of laundry. Maybe I can rest tomorrow afternoon!! 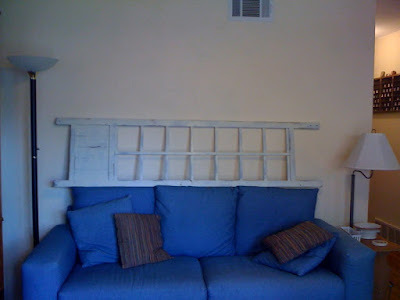 So, when I saw this reclaimed trellis, I knew instantly that it would be perfect. I need to decide if I am going to paint it -- I'm afraid it would just blend into the creamy walls right now (and I'm not up for painting my living room at this point).....so the dilemma over color begins to rage. Freshen up the white? I've got brown paint left from my office re-do last summer ...... I've sent photos to Kelly to get her take as she is often my decorating guru, but I'm gonna throw this out there for you as well...... any thoughts?? 3. Would you kiss the last person you kissed again? yep - Emily kisses are just right! 39. What was the last question you asked? "Are you ready to work on _____?"